Leadership and team-work course: Dancing with Power - how to nurture a healthy relationship with power. Teams that perform well are deemed successful. People perform best in a healthy, comfortable environment, where they are treated fairly and with respect; where individual talents are recognised, nurtured and utilised; where opinions matter; where conflict does not mean division; where challenge is reasonable and where communication between all is open, authentic and non-judgmental. There is no place for fear or dishonesty. We can empower your team to achieve harmony and success. A herd of horses must work effectively together if they are to survive and thrive. Each member knows their place and their role. There is absolute honesty and integrity, even when resolving disputes. Horses look out for each other, they respect their elders, nurture their young and form strong bonds. Able to clearly demonstrate their needs, horses are never afraid to express their feelings, but also recognise what’s required for the common good. Herds are intolerant of bullies, who are quickly isolated. A good herd leader has the sense and confidence to recognise when tough decisions must be made, including discarding the weak. The same set of rules apply to healthy human herds, whether that’s in a family or business environment. There is much we can learn from the horses’ wisdom. 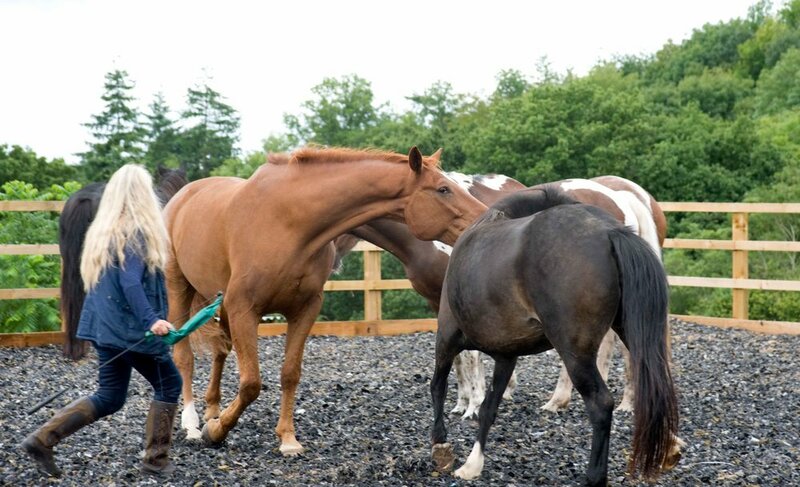 Through observation of the herd, practical demonstration and hands-on exercises with the horses, you’ll learn to recognise each trait in yourself, to temper those which are too strong and to allow lesser aspects to gain strength. Through learning to stay grounded and listening to our bodies, we also focus on setting and recognising boundaries, assertiveness, adjusting energy levels to suit individual situations and providing non-judgmental feedback. Saturday and Sunday, March 24-25, 2018. £500 per person. Book before January 22 to benefit from a £50 early bird discount. The course is for four to six people.